BAKERSFIELD, CA. 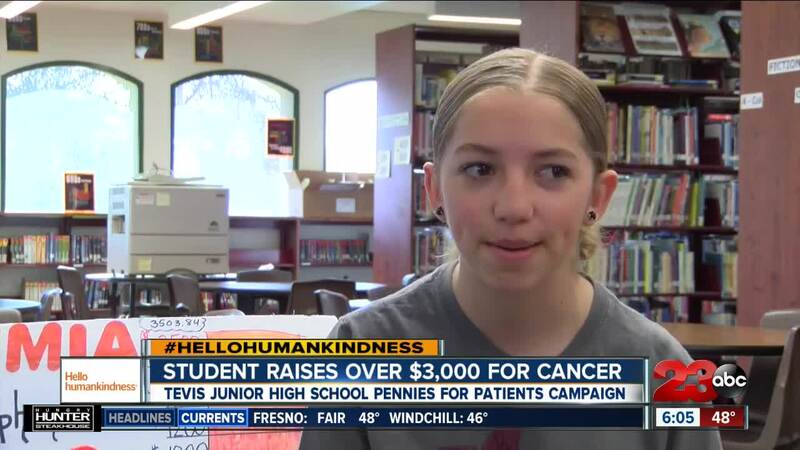 — Abigail Meier, 8th grade, raised $3,503 for Tevis Junior High School's Pennies for Patients fundraiser. The fundraiser benefits the Leukemia and Lymphoma Society. Although Meier doesn't have any personal connecting to the cause, she has been raising money for it since she was in Kindergarten. “She truly is doing this out of the kindness of her heart to support others and she gets joy from how much shes raising because she feels she can make a difference in these peoples lives," said Janet Tadros, Tevis HS Counselor. The school set a goal of $2,019 and Meier single handedly helped them surpass that goal by raising over $3,000. “Mr. Rolland is another teacher here and he is competitive. Last year, I was trying to get the same amount of money as him and the last day he turned in his money and I was $100 under him so I turned in $200 after him and beat his class," said Meier. The friendly competition prompted Meier to continue raising the bar for her goal every time she would reach it. “I think she collected $2,000 in two days. It’s been humbling to watch her to see people giving her money sometimes without any questions," said Stefanie Meier, Abigail's mom.